6/10/09 – Acquisitions – Pau, Musée des Beaux-Arts – The Musée des Beaux-Arts in Pau emphasizes the strong points in its collections with regular acquisitions. Two of the guidelines in this policy concern landscapes of the Southwest by 19th century artists (see our article on the 19th century catalogue, in French) and 17th and 18th century Italian painting (Cantarini, in Fench, Carpioni…). Two very recent purchases confirm these tendencies. The first is a study by Francesco Trevisani (ill. 1 ;we will soon post a better picture of it), which particularly ties in with current events. 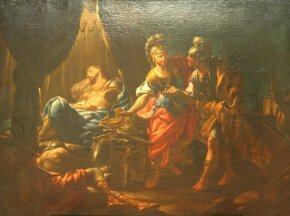 The subject, an episode from the life of Alexander the Great, as well as its format, in fact link it closely to the painting for which the Louvre is supposed to compensate Friedrich Unger’s heirs (see news item of 15/9/09) . Unlike the latter however, this one is a night scene often favored by Trevisani. The most famous example of this manner is the décor in the chapel of the Crucifixion inside the church of San Silvestro in Rome. The second acquisition (from the cabinet Blondeau-Bréton in Paris) is a painting by Paul Huet representing The Cirque at Gavarnie (ill. 2). The artist spent some time at the spa in Eaux-Bonnes from 1849 to 1847 where he painted notably alongside Eugène Delacroix. 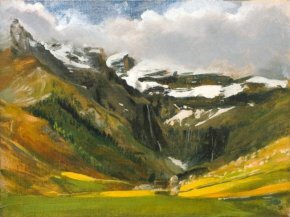 His outings in the surrounding area often took him to the Cirque at Gavarnie. This work was painted in the spring, in either 1846 or 1847. The Musée des Beaux-Arts in Pau already owns two works by Paul Huet from when he was in the region. In concluding this article, we would like to point out that the restoration of the Last Judgement by Nicolas Pickenoy acquired by Pau last year (see news item of 13/10/08) uncovered the artist’s signature. The final work corresponding to the study in the Louvre was part of a series of eight canvases painted by several Italian artists for the décor of the Salon in the palace of La Granja de San Ildefonso, in Segovia, Spain. It is not at all sure that the study acquired by Pau is in any way related to this commission. It was bought directly from persons living in Lorraine, France.